After nearly thirty years of canon-busting, critical revisionism and renewal, is it possible to generalise about American women’s narratives produced during the past century? For American women’s fiction (and associated forms of prose, such as autobiography and the diary), continual recoveries of lost works mean that the ‘canon’has hardly come into being. As soon as a canon begins to take shape, the deconstructive turn of modern criticism undermines its foundational principles. Women’s fiction, as a body of work sui generis, began to attract serious and sustained critical attention in the wake of the 1960s women’s movement. 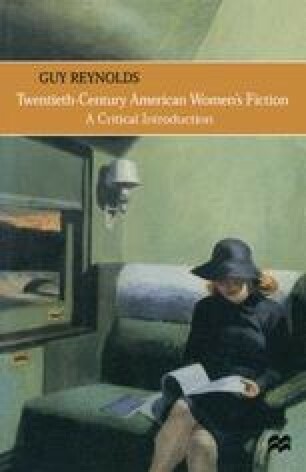 Feminist critics attacked what they saw as the ‘masculinist’ bias of American literary criticism; the motifs, topics and themes celebrated by the masculinist critics were, it was now argued, highly gendered, and took little account of the contribution of American women to the national literature. Attacks on the male bias of literary scholarship went hand-in-hand with recoveries of lost female writers and marginalised traditions (the increased attention to nineteenth-century sensational and domestic writing dates from this phase in the early 1970s). Well-known writers such as Willa Cather or Edith Wharton continued to be read; but their work was increasingly seen as a distinctively female achievement.